Since I began home-brewing in May 2009 I’ve brewed mostly within the parameters of the beer styles that I’ve brewed. Meaning, even when I put a slight twist on a traditional beer style I have yet to utilize ingredients that have the potential to mask the aromas and flavors of the base style. In turn, when scaling up my ESB recipe from its 1 gallon test batch state to a full 5.5 gallon batch I chose to keep the Honey Malt in its grain bill in order to accent the bready qualities of the Maris Otter base malt. I also decided to use Fuggle hops instead of Willamette in order to remain as true to the style as possible…As is the case with many home-brewers I chose this beer’s name based on how it reminds me of an interest of mine and what situation I can see myself enjoying it. I swapped out the word ‘special’ and used ‘precious’ instead in order tie together my wife and my love of The Lord of the Rings and my picturing of myself drinking a traditional ESB in an English pub. Wyeast 1968 London ESB: Fermented @ 65-67F for first 3 days i.e. until fermentation slowed down and then slowly ramped up to 68-70F where I left it for another 12 days. Aroma (9/12): At first whiff the yeast esters came off as acetylaldehyde, but after warming up for a moment they morphed into a fruity sweetness that I perceived as the honey malt blending with the yeast and hops. The malt character dominated the aroma though. It was quite unique and definitely more rich and developed than when I first brewed this beer a year ago. Rich Maris Otter breadiness blends with a specialty malt moderate sweetness. A hint of astringency and or sharpness present. Appearance (2/3): Attractive burnt gold color with an off white head which did not linger for so long, but left some nice looking glass-lacing behind. Cloudiness not to style, but does not detract too much from the beer’s overall attractive appearance. Note: A BJCP judge would likely take a point off for it though. Flavor (15/20): Follows the aroma almost seamlessly. The rich bready malt remained the star of the show while the honey malt sweetness added complexity. No distinctive hop character was present, but the honey sweetness and yeast esters combined and added a hint of sweet orange peel and dried apricot in the finish. No obvious off flavors. Mouthfeel (3/5): Despite this beer’s higher than preferred / style guideline required finishing gravity it does not come off as being too sweet. Medium bodied with moderate carbonation. Despite having been served from a keg carbonation could be a touch higher. A hint of yeast ester astringency in finish. 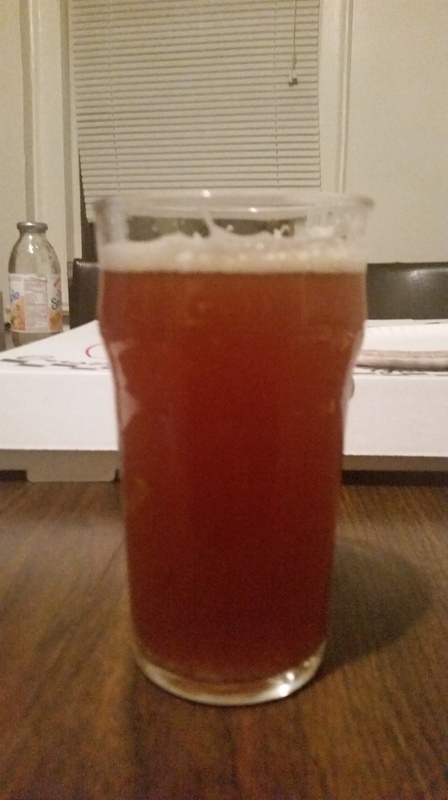 Overall (7/10): This beer’s unique malt character is what makes this beer a success. However, the honey malt’s contributions were at times too intense. With a bit more hop character, carbonation, and a drier finish this could be an award winning ESB.